The practice of journeying to locations of special significance is a common feature of many religious traditions and it has played a formative role in the history of Buddhism. These range from analytical perspectives that highlight the distinctive histories and social dynamics of individual pilgrimage sites in the diversity of cultures shaped by Buddhism, to perspectives reflecting a broader comparative framework. We cannot say with assurance when pilgrimage first became a part of Buddhist tradition. However, the fact that the canonical collections of several early Buddhist schools include a Sūtra in which Gautama Buddha himself exhorts his followers to visit sites associated with his life indicates the centrality that pilgrimage came to have in the early centuries of the Buddhist movement. This passage occurs in the Mahā-Parinirvāṇa-Sūtra, which narrates the Buddha’s last days before his final passing away. and the passage concludes by promising that anyone who dies while undertaking such a journey with serene joy will be reborn in a blissful Heavenly Realm. The earliest archaeological evidence of Buddhist pilgrimage comes from inscriptions commissioned by the Indian Emperor Aśoka in the 3rd century B.C.E. There are also later textual traditions that give Aśoka a formative role in the creation of a Buddhist sacred geography through the enshrinement of Gautama Buddha’s relics in 84 000 relic monuments throughout his Empire. According to the Rummindei pillar edict (near Lumbinī, in Nepal), Aśoka visited the site of the Buddha’s birth and erected a commemorative pillar there. and a third, located at Nigālī Sāgar (near Lumbinī, Nepal), tells of Aśoka’s visit to and enlargement of the relic monument of the former Buddha Koṇāgamana, suggesting that a devotional cult centred on the lives of previous Buddhas had also emerged at this time. These remains suggest the existence of well-developed regional pilgrimage centres supported by a wide range of donors, including lay and monastic men and women. Instead, the sites have been rendered religiously powerful through the enshrinement of relics, and through vivid artistic representations of scenes from the Buddha’s biography, including his past lives. 2) later enshrinements of physical objects that represent him, either through alleged historical continuity (bodily remains or objects he used) or visual evocation (sculptures and paintings). These were not mutually exclusive options, as many sites were associated with events in the Buddha’s life and with later relic and image enshrinements; some were associated with the presence of previous Buddhas, as well. As many scholars have noted, there was a close relationship between the development of a comprehensive Buddha biography, which was not a part of the earliest tradition, and the emergence of pilgrimage sites. Buddhism was first transmitted into China around the beginning of the Common Era. Beginning around 400 C.E., we find the earliest surviving accounts of Chinese Buddhist pilgrims to India. These testify to the emergence of major pilgrimage routes, extending through Central Asia and north-west India into the Ganges basin, which attracted pilgrims from distant lands. Among the most prominent of these monk-pilgrims were Faxian (ca. 337-418) and Xuanzang (ca. 600-664), each of whom travelled to India through Central Asia and spent many years collecting texts and visiting important religious centres throughout the Indian subcontinent and beyond. Faxian’s account testifies to the great proliferation of places that had come to be associated with events in Gautama Buddha’s life, particularly those of a miraculous character, and to the number of relic monuments attributed to Aśoka’s great relic distribution. Faxian also spent 2 years in Śrī Lanka, and he mentions the tradition that Gautama Buddha visited the island in order to pacify the Nāgas residing there, a tradition narrated in detail in the monastic histories of the island (e.g., Dīpavaṁsa, Mahāvaṁsa). On one of his sojourns, the Buddha is said to have visited and consecrated a number of different locations around the island and these form the nucleus of what was eventually defined as an authoritative list of 16 Śrī Lankan pilgrimage sites. Narrative traditions of a similar character later developed in Southeast Asia, linking the movement and enshrinement of relics and images with locations in the region already sacralised by legendary visits of Gautama Buddha. 1) On the one hand, monks and nuns throughout the Buddhist world travelled back to the Buddhist heartland for access to texts, to places of religious power associated with Buddhas and other powerful religious figures, and to centres of Buddhist learning (thus a centripetal force). 2) An analogous, centrifugal movement drew Buddhist relics and images (and in some cases, Gautama Buddha himself, as recounted in later texts) outward to create new centres of pilgrimage in what had been the territorial margins of Buddhist tradition. In many cases these new devotional centres were established in places long regarded as religiously powerful because of the presence of local or regional deities, places often marked by striking natural features such as mountains, lakes, and caves. Typically, these “pre-Buddhist” beings were not simply replaced, but instead subdued and converted into guardians of Buddhist sacredness. Such centres of pilgrimage undoubtedly brought together devotees with diverse religious identities and forms of practice, thus facilitating the integration of Buddhist ideas and practices into broader religious milieu. The fluidity of interaction that pilgrimage so effectively orchestrates has contributed greatly to the expansion and adaptation of Buddhist traditions outside the land of its origins. Buddhist pilgrimages are generally voluntary undertakings motivated by a range of individual concerns, including the acquisition of merit, the need for purification and expiation, and hopes for healing, increased prosperity, fertility, and so on. They also commonly bring together people from diverse social and religious groups. As a result, they have frequently encouraged the interplay of different symbolic systems and behaviours, thus facilitating the adaptation of Buddhist traditions to new historical circumstances. since popular beliefs and practices were drawn from Daoism and Confucianism, as well as Buddhism, and these seemingly exclusive religious designations are meaningful only when referring to professional elites. Thus these sites have commonly enabled a multiplicity of meanings and a diversity of practices to flourish side by side with varying degrees of integration. A minimal definition of pilgrimage is a journey to a place of special religious significance, and movement here means the movement of individual bodies away from the places where they typically reside and toward a centre of intensified religious power. A pilgrimage is usually an exceptional undertaking, often involving significant disruption of the pilgrim’s ordinary life and frequently entailing some element of physical discomfort or ordeal. Among the more striking examples are the protracted journeys of the early Chinese pilgrims to India: Faxian was away for 15 years, Xuanzang for 16. The degree of difficulty and danger faced by the pilgrim obviously varies widely; in addition, specific Buddhist pilgrimage sites have been more or less accessible at different historical periods. The availability of cars, buses, and planes has clearly transformed the pilgrimage experience for many modern participants. As was the case for the early Chinese pilgrims, the goal of the journey was often not a single site of religious significance, but rather the completion of a pilgrimage route punctuated with a succession of sites, each with its distinctive associations. these reflect the common Buddhist practice of circumambulation (Sanskrit, pradakṣiṇa) in which one ritually honours a person or object of religious authority by circling them clockwise, thus keeping the right side of the body facing them. 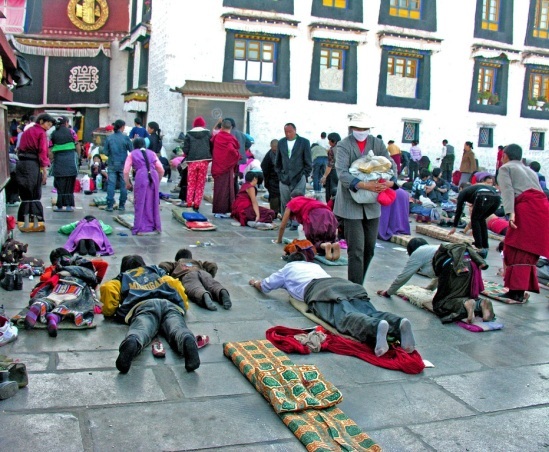 Circumambulation of sacred mountains is a prominent feature of Tibetan Buddhist pilgrimage, with some pilgrims going so far as to complete an entire circuit, sometimes hundreds of miles long, with a succession of full-body prostrations. Other forms of ritualized devotion include various forms of offering, such as flowers, incense, light in the form of candles or lamps, gold leaf, and so on, as well as the recitation of appropriate chants or Mantras. as noted above, other supernatural beings and forces are commonly believed to reside in pilgrimage sites and these are also venerated, sometimes in fulfilment of a special vow to honour the deity in return for a specified benefit. Finally, a broad range of Buddhist figures are deemed worthy of veneration by pilgrims, including Buddhas, Bodhisattvas, and Arhats. In some Chinese Chan Buddhist communities, the miraculously mummified bodies of deceased teachers became the object of pilgrimage. Many pilgrims wear special clothing that clearly distinguishes them from non-pilgrims. The hierarchical classification of the body according to standards of purity, with right favoured over left and higher over lower (head/feet), structures much devotional behaviour, such as circumambulation and offering rituals. Social hierarchy is present, as well, in the authority exercised by experienced pilgrims over novices, and by local officiants and guides who mould the behaviour of the visiting devotees. Hierarchies of purity and sacrality are also commonly reflected in the spatial and architectural organization of pilgrimage centres; this may explain why mountains and other elevated locations are so frequently the “natural” settings for pilgrimage. Many Tibetan pilgrimages operate on a 12-year cycle, while visits to a number of Śrī Lankan pilgrimage sites are organized around a calendar of full-moon-day observances.